Grizzly bears are native to the northwestern parts of North America, including Alaska and parts of western Canada. Despite the fact that grizzly bears are mostly solitary creatures (except when rearing young and mating), they still have a complex system of communication that makes use of vocalization, body language and chemical odor cues. Grizzly bears make true vocalizations rarely, normally relying on non-voiced sounds. Generally females will moan, grunt or growl as a means of communicating with her young. Males may make similar vocalizations, in addition to bellowing, during mating season combats with other males. Non-voiced sounds may include snorting, huffing, clacking teeth, popping the jaw or blowing air out of the nostrils -- all to indicate agitation, aggression or fear depending on the context of the situation. Posture and movement are key components to grizzly bear communication. How a bear is standing, moving or behaving can provide clear indicators of the bear’s intentions to both other bears and humans. A grizzly who is walking away, sitting or lying down is demonstrating subordination and an unwillingness to fight. Similarly, a bear who yawns, looks away and remains motionless is indicating that he wants to be left alone. Aggression in grizzly bears is often demonstrated by lunging with ears flattened against the head, slapping the ground, lowering or swaying the head, or charging. A bear who stands on his hind legs is not necessarily attempting to convey aggression, but is more likely simply attempting to get a better look at his environment. As reported by BBC News, male grizzlies may use scent communication in the form of “tree rubbings” -- wherein they rub their backs, heads or chests against a tree to mark it with their scent to alert other males to their presence and reduce confrontation. By marking a tree with his individual scent, a male grizzly is letting others know that he is in the area. A smaller male who approaches an area with trees marked by a larger male may choose to leave the territory rather than risk a fight. Grizzly bears may occasionally communicate through visual methods as well, clawing or chewing on trees to alert other bears of their presence. This is a similar activity to the tree markings intended to leave behind scent, and may be used for a similar purpose. This activity is relatively rare among grizzlies, however. 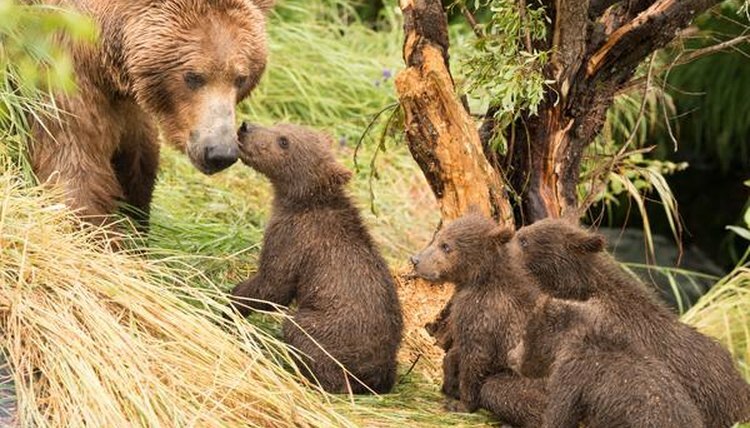 A 2003 study published in "Wildlife Biology" indicates that only 9 percent of trees rubbed by grizzly bears in Yellowstone National Park included evidence of clawing or biting.